Dimensions: 22 Inches Wide, 21 Inches Deep, 34 Inches High. -Flat woven poly-ethylene on an aluminum frame with cushions in Sunbrella fabric makes this set perfect for total outdoor use! -You will love that these 4 dining chairs are stackable. 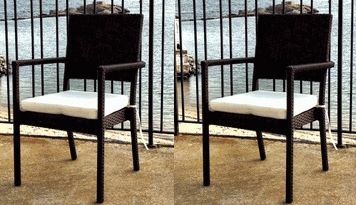 Our South Hampton Resin Wicker Dining Chair is a quick ship item! Hurry only 1 set of 4 Left! 22 Inches Wide, 21 Inches Deep, 34 Inches High.